screenprotector.net > Why screen protector are important? We got many many inquiries everyday who request real Japan made roll material.We MUST say here not only that material with our grade should not be available anywhere in roll form, but also that a formula and processes of coating chemicals are different from factory to factory. Because We are the inventor of these products. In order to get our kind of material which has the best optical properties as well as optimal stickiness and hardness, we have to go through a lot of testing, spending a lot of time and money as well, as there is no information on such a formula available from other companies. Using same chemicals do not mean you can get the same result. In our industry, to refer to a price of film by kilogram means that the film in question has no functional coating like ours. Rather it is simply a PET roll, which we know is not what purpose of roll is using for. If allowed to elaborate on the manufacturing of our material, I should say there is also specialized machinery that detects where bubbles or scratches are on the roll being processed at a plant. It is quite an expensive system, yet not a cutting machine itself. Then, you have to remove the portions with bubbles, wrinkles or scratches detected by that system after cutting the roll into sheets. Further, you also have to rid of sub-standard sheets that well-experiened factory workers detect by eye from those sheets. Without going through the above processes before and after cutting the roll material, decent screen protectors cannot be manufactured. Undoubtedly, aside from the waste created by a strict quality standard, doing the above processes in Japan adds to our cost substantially. 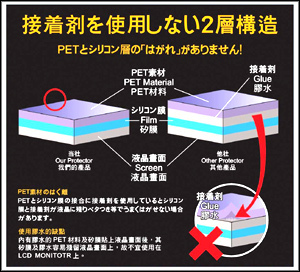 In a similar way, however, the same processes cannot be done more cheaply outside Japan nor it is worth risking possible deformation caused by long transformation of a roll material if you wants to produce a decent LCD screen protector as advertised on your website. LCD screen of your device from everyday wearing. It is an important investment on your PDA, Mobile phone and Digital Camera/Camcorder because a replacement screen could cost over US$200! Inherent to its unique material properties, our screen protectors are much more wearable and durable. It can be used much longer than other screen protectors. The properties of this screen protector are specially designed to reduce distractive glare caused by reflected light. Reduces the strain of your eyes by blocking 99% of the harmful UV radiations emitted from your LCD/CRT display. This feature is critical especially for those who are exposed to and need to operate LCD devices for a long period of time each day. This transparent razor-thin sheet affords your stylus with a smoother navigating surface while providing a tough layer of protection. Just compare the prices and the qualities, you will find the best selection here.